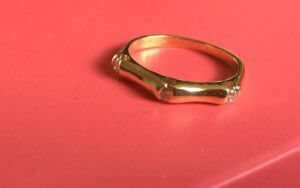 I had the pleasure of working with Jasmine and Cesare (Jas & Ces) to design and make their wedding rings. 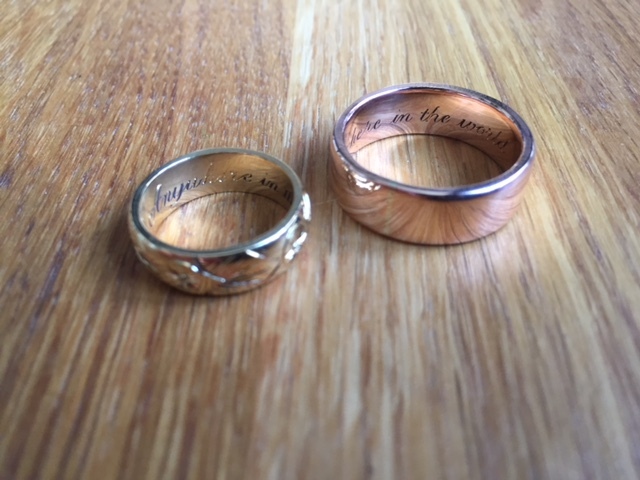 They wanted to do something extra special, and so I suggested they got involved in the actual production of their rings and they jumped at the idea! Ces proposed to Jas with his late Mother’s engagement ring while on holiday in Naples. 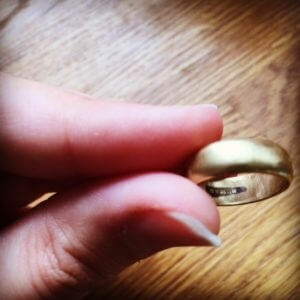 It is a very special trilogy ring made by a family member in Italy back in the 1980s. The three diamonds are tension set in an almost bamboo shaped 18ct yellow gold band. Because Jas will generally wear her wedding ring on its own, this gave us a lot of freedom to do something creative. Inspiration came from her Grandmother’s wedding ring that she inherited earlier this year; Jas loves the wide band and the starburst engraving, so this sent her into a Pinteresting frenzy! 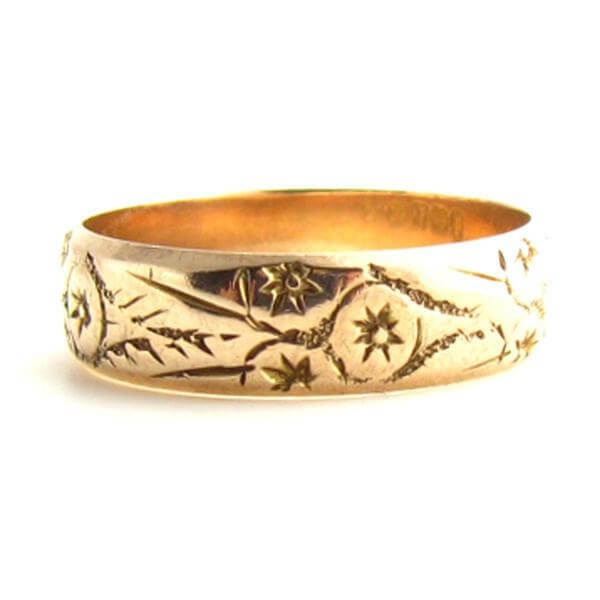 During her pre-ring design session research, she discovered Victorian engraved wedding rings and fell in love with the botanical themed etching, such as the example below. We picked up on the correlation between the sunburst shapes in the Victorian ring and the starburst shapes in her grandmother’s ring and decided that was something she really wanted to include. We simplified the design to better suit a slimmer band and make it unique to Jas. The finished design sits beautifully with the bamboo-shaped engagement ring and looks fantastic on its own. Jas is a keen gardener, and she and Ces live the good life with their three chickens and homegrown fruit and veg, so the natural, floral inspiration is perfect. Wearing jewellery is a new concept to Ces, so he was naturally a little nervous about the bespoke process. 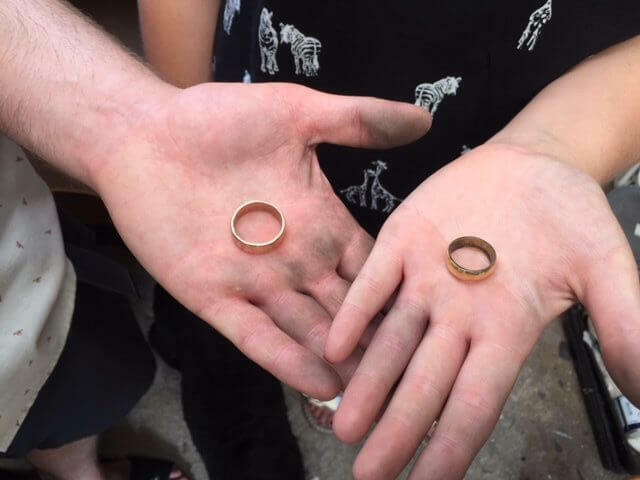 He is an engineer so won’t be able to wear his ring at work; however, he felt the exchanging of rings during their ceremony was important, and wanted to have a ring to wear on special occasions. We immediately discounted making his ring out of the same 18ct yellow gold that Jas wanted to match her engagement ring as it doesn’t suit his complexion. 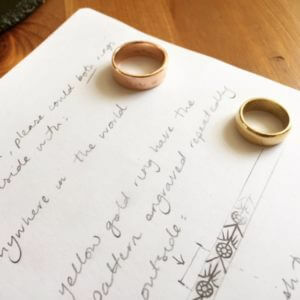 He was initially drawn to mixed metal designs, and he liked the look of 18ct white and 9ct rose gold rings; however, after talking it through and looking at all the options, he had a change of heart and decided that a simple band was actually what he wanted. He liked the warm coppery colour of 9ct rose gold so decided to go for that. 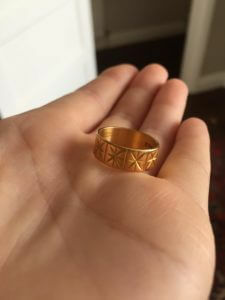 The coppery hue suits his skin tone beautifully and ticked the box for being slightly different than the standard wedding rings seen on the high street, of which the vast majority are white metals. Ces wanted to keep the design simple and unobtrusive, so we chose a flat profile, 6mm wide, with softened edges to make it nice and comfortable to wear. We had a discussion about metal finishes, and although Ces liked the look of brushed rings, he eventually decided that a polished finish would have more longevity and classic feel. 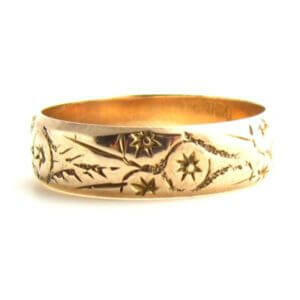 Once Jas and Ces had signed off my designs, I ordered the metal, and we arranged our ring making day! 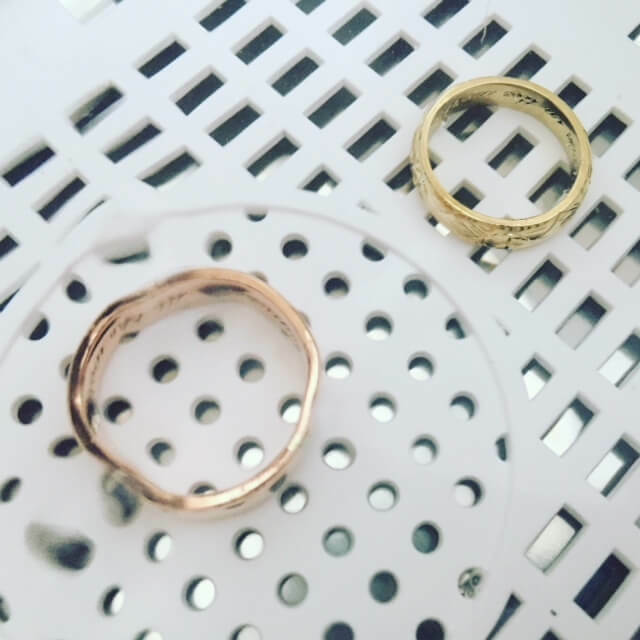 We started by cutting the metal to the right length for their ring sizes, then annealed the metal to make it softer to work with. Once cool, the pair set about bending their metal strips into rings. We were then able to solder the rings together. I enjoyed showing them the magic of soldering; it has always been my favourite part of the jewellery making process as when the solder melts and runs along the join, it is pure alchemy! Once the rings were joined, we then set about making them round on the ring stick. When the rings were nice and circular, Jas and Ces filed the edges flat and we began shaping the rings according to their chosen profiles. 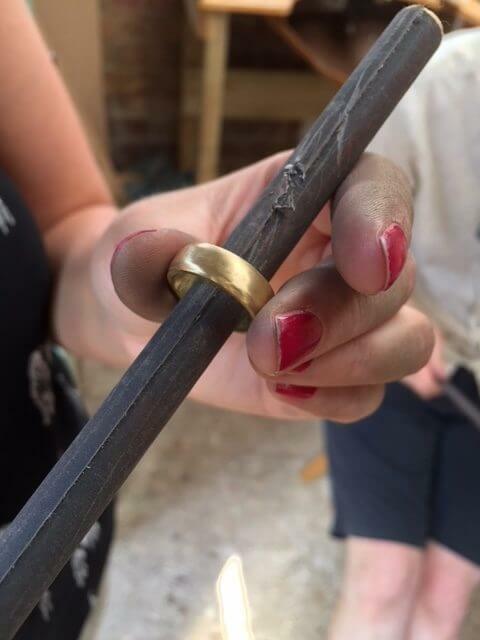 Jas and Ces were understandably really proud of their achievements over the day and I think they really loved seeing the transformation from flat sheet metal to round, curvy rings in the space of a few hours in my workshop. Even their dog Winston got involved! 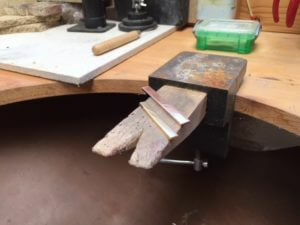 The next step was to send their rings to the London Assay office for hallmarking. After a bit of touching up, the rings were sent for engraving. 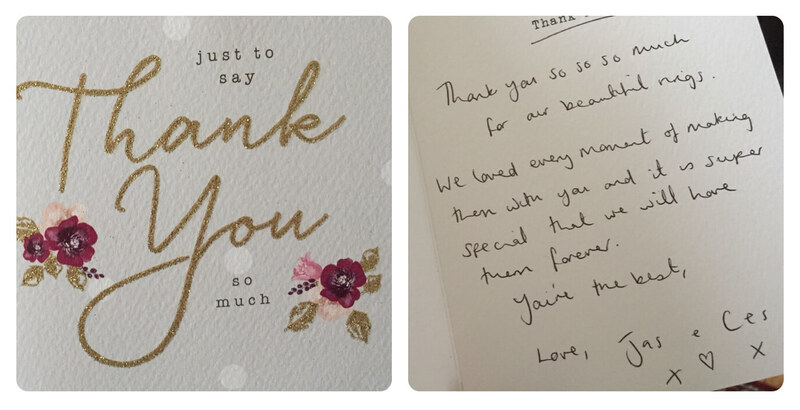 The romantic pair decided to engrave a phrase they often found themselves saying while traveling or exploring together: ‘Anywhere in the world’ – because they could be anywhere as long as they have each other. The final polish and a spin in my ultrasonic cleaner to remove the traces of the polishing compound meant the rings were ready for handover. 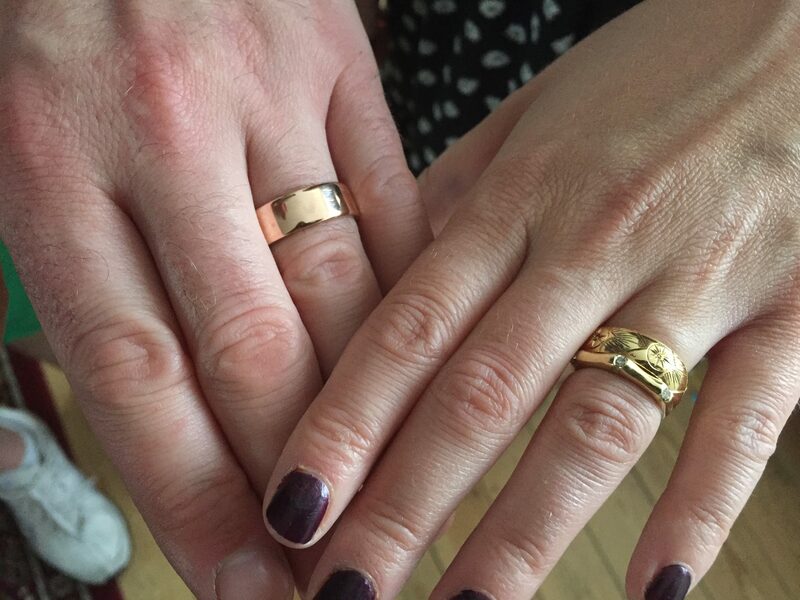 So once the rings were sparkling, I was able to hand them over to their rightful owners – my favourite part of the job! Jas and Ces are over the moon with their handmade rings and I think it’s fair to say that personally designing and making them has added something extra special to a very sentimental pair of rings.